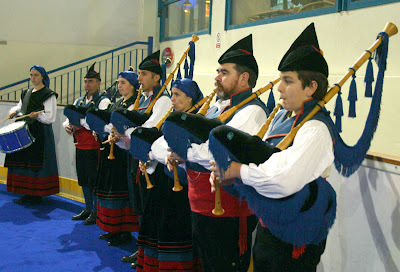 A slightly different look and sound of pipes and drums led the teams at the closing ceremony! Team Denmark were ´second´according to the medals. 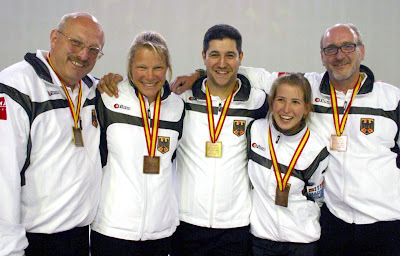 Team Germany took third place after beating Austria in the bronze playoff. The Final. Last night´s post was a bit sparse. What happened was this. Wales had control of the game in the early ends. Denmark came back and squared the game in the sixth. Adrian Meikle attempted to blank the seventh. He played good weight, touched the Danish stone but didn´t remove it from the house. So, the Welsh had last stone in the eighth, but were one behind. Joel Ostrowski, the Danish skip, drew the prefect shot with his first to lie hidden back of the four. Adrian followed but lay open. Denmark was still shot stone I think. Joel then played a shot that will live in his memory. As the stones stopped moving, Wales were now in shot position. All Adrian had to do was draw to the four foot, with backing there to help, and he was right on target. 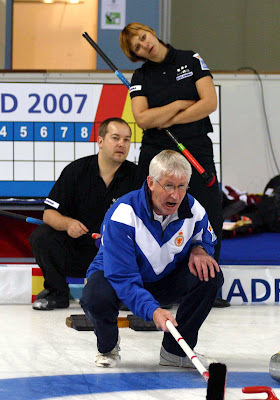 Wales was surprise winners of the European Mixed Curling Championship 2007! All the results are here. Germany beat Austria in the bronze playoff. Of course, my headline should have been, ´REFORM CURLER WINS EURO MIXED´, as Blair Hughes, the Welsh lead is a member of my own club. She plays with secretary Michael Burton and former Scottish Senior champ Ronnie Peat. After the final a delighted Blair paid credit to Olympian Rhona Martin for sorting out her out-turn last year! My memories of the week? Plenty of them. 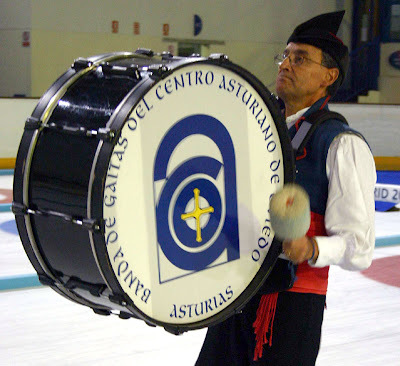 First and foremost was the fact that the Spanish organisers brought it off. What an achievement to have staged a major championship - and make no mistake this was one - in Madrid. The arena was pretty good. Not sealed though, no dehumidifation, and gave the ice technicians more than a few headaches. No wonder that Scott Henderson and Mark Callan are known as experts in ´extreme icemaking´. They provided an excellent ice surface, even on the finals day which was the only day NOT to have a blue sky. Pity about the stones. Not the local organisers´fault. They realised their local stones were not good enough for the championship and stones were supplied by the World Curling Federation. Let´s face it, they were poor. Disappointing. The players deserve the best and for whatever reason they did not get it here. 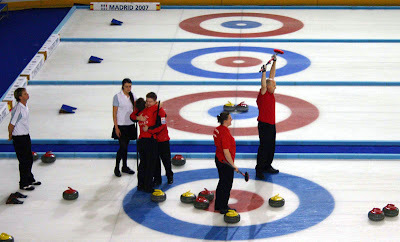 New, emerging curling nations had their day here in Madrid. Did you note that there was no Norway, Switzerland or Sweden in the playoff stages. The standard out there is getting better! Mixed curling is different (do I need to even say this) and I´m pleased to say that the teams looked to be enjoying the event, on and off the ice. I was proud of the young Scottish team and all credit to the old man, dad Gordon for taking the team on. Reaching the quarters was a good result and but for an inspired performance by thir opposition skip they could certainly have gone further. 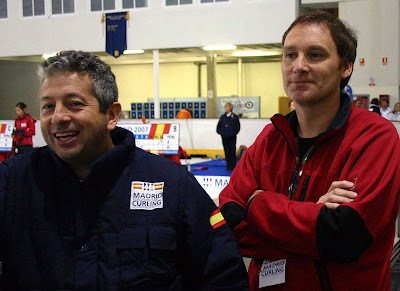 For more thoughts on the event, you´ll have to read the November Scottish Curler magazine. Please support our team! I think I might have an image or two more to put up, but otherwise that´s it from Spain. 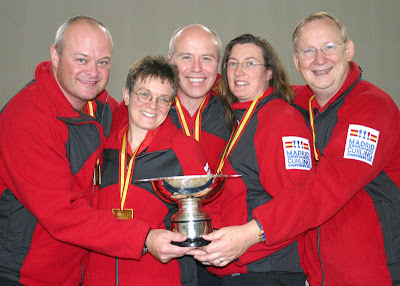 From top: The European Mixed Curling Champions, Wales. L-R: Adrian Meikle, Lesley Carol, Andrew Tanner, Blair Hughes, Chris Wells; Celebrations; Adrian Meikle; Hard work; Joel Ostrowski; Camilla Jensen. So how did it happen? Denmark one up in the eighth. Wales have hammer. Two stones to come. Joel plays a clearance which moves his own shot stone. From facing a difficult draw to tie the game, suddenly Adrian has a free draw for the championship. No mistake. Wales have the title. A review of the event tomorrow, I'm off to help the Welsh celebrate. From top: Adrian Meikle; Andrew Tanner delivers, Lesley Carol and Blair Hughes are the sweepers, Germany sweeping, Andrea Schopp; Denmark v Austria; Denmark sweeping. Adrian Meikle´s Welsh side continued their run of great games to beat Germany. Denmark took four in the first end, and they were on their way to the final. From top: Scotland v Denmark; Austrian skip Claudia Toth; the Russians discuss their last shot in the extra end against Austria; the view from the cheap seats! ; the Welsh march on. 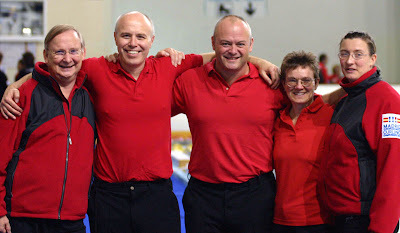 L-R Chris Wells, Andrew Tanner, Adrian Meikle, Lesley Carol, Blair Hughes. 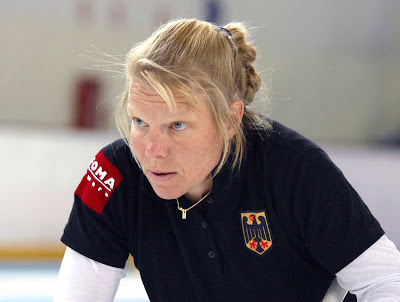 STOP PRESS: Next year´s Euro Mixed will be in Kitzbuhel, Austria (that´s where Claudia Toth and her sister Karin hail from). Anna Sloan (16), Eve Muirhead (17), Glen Muirhead (18) and Gordon Muirhead (53 but nearer 63 after this week) have done Scotland proud! 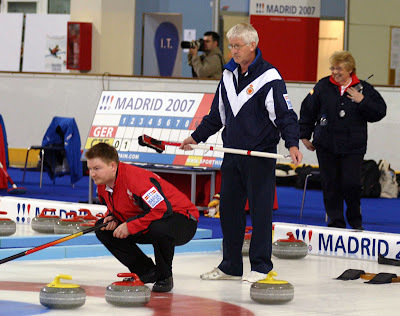 They reached the quarterfinals of the Euro Mixed Curling Championship in Madrid but that was as far as they could go. Against a Danish team firing on all cylinders and with a skip Joel Ostrowski who never missed a shot, they went into the last end one behind. The Scots lay two but the Dane played the double for the win. Elsewhere Germany rolled over the Czech Republic, and Austria upset Russia at an extra end. But it was the Welsh team of Adrian Meikle, Lesley Carol, Andrew Tanner and Blair Hughes who were the heroes of the night, beating Estonia. Results are here. A few photos to come shortly. From top: This one to show you that I´ve been telling the truth! ; Welsh lead Blair Hughes; Welsh skip Adrian Meikle; Karel Hradec and Jana Berankova (apologies if I have the wrong name) discuss the final shot of the game against England. 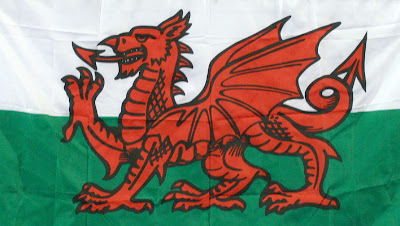 Adrian Meikle´s Welsh team of Lesley Carol, Chris Wells and Blair Hughes have made it through to the quarterfinals! They beat Hungary in a tiebreaker this afternoon - in an extra end. Exciting it was too. England were less fortunate. 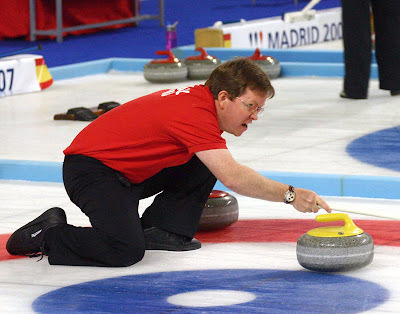 Alan MacDougall´s side had fought back from 1-4 down against the Czech Republic to be just one behind in the eighth. They needed to steal and looked to be in a good position to do so. Alan´s final stone was a guard which just drew too far, allowing Karel Hradec a relatively easy clearance for the win. So, to summarise the position after all the preliminaries. There were four sections, with six teams in each. Section A saw Scotland qualify top, with the Czech Republic coming through after a tiebreaker. Section B had Germany undefeated, with Austria qualifying after extra games too. In Section C the Russians went undefeated, and Wales came through after a tiebreaker. Four teams finished equal in Section D. Two tiebreakers saw Estonia and Denmark come through. The upset here was the elimination of Switzerland and Sweden. A few more pics to follow. 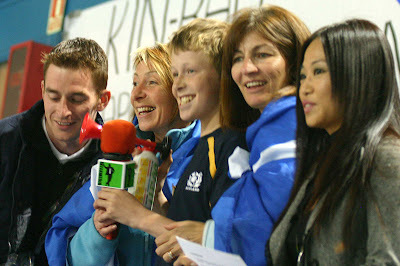 From top: Glen Muirhead who plays last stones for Scotland; the Scottish team in action against England; Lana Watson, England´s third, played some great shots against Scotland; Scottish supporters were interviewed by a local television station during the game - ´Is this an air horn I see before me?´; the Irish supporters were much better behaved (for results see official scores here); a rule (or should that be a decision - or even an indecision) of umpires. 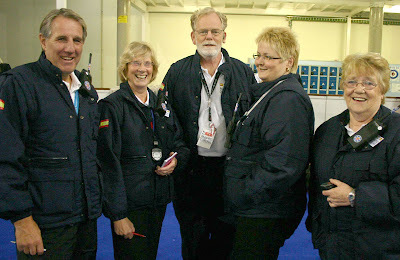 L-R Mats Olofsson, Dor Borthwick, Leslie Ingram-Brown, Eeva Rothlisberger, Christine Shaw); Dor and Leslie do a DSD (draw shot distance) as a Russian team member observes (should this be a caption competition pic? ); and finally - a stone. You are NOT going to believe this. The stones or rocks or chuckies or bricks or granites or Ailsas (call them what you want) are BRAND NEW. Straight out of the box, never been on a sheet of ice before, delivered straight to Madrid from Kays, never been matched. They belong to the World Curling Federation. And is there uncertainty over how some stones are playing? Yes, of course there is. I don´t usually spout my opinions in the blog, leaving this to the magazine (subscribe here! ), but the decision to use a completely new set of stones in a major championship was surely misguided! Especially as the ice technicians are doing a great job under difficult conditions. 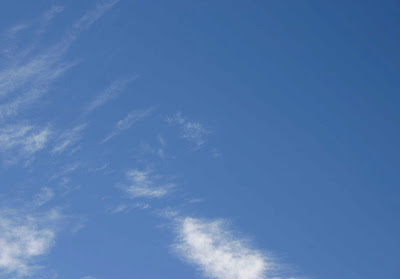 Right, off to enjoy another blue sky day and to see who makes it through the tiebreakers into tonight´s quarterfinals. 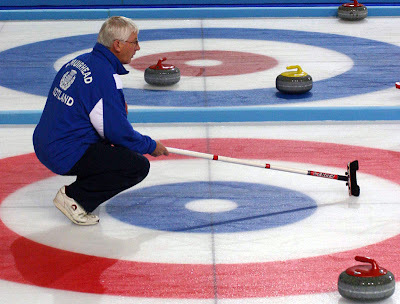 A Scotland v England encounter in any sport, including curling, always has an extra edge. Anna Sloan, Gordon Muirhead, Eve Muirhead and Glen Muirhead slugged it out against Suzie Law, Andrew Reed, Lana Watson and Alan MacDougall in their last section game, both teams on identical 3-1 win-loss records. It was a ´nip and tuck´affair (quote from an unbiased observer). I saw it as a game of great shots - Glen´s draw against three at the second end was one such. And it was a game of missed opportunities - Alan was an inch short at the fourth which would have seen his team take a two shot lead. Tension, drama, excitement there was, right down to last stone of the eighth. And then into an extra end! Who won? The English four captured the hearts and minds, and may well have been shown to have been ahead in the stats, had there been any at the event. But it was the Scottish side which was victorious on the night. Scotland is through to the quarterfinals! MacDougall´s four are not out of it. They finished on the same ranking as the Czech Republic, and will contest a tiebreaker tomorrow for the second qualifying slot from Section A. Photos tomorrow. The quarters are in the evening so there may, or may not, be a late post when they are finished. You can get all the results on the official website here. From top: Gordon Muirhead in the head; Lead Anna Sloan, English skip, expat Alan MacDougall; Championship information; Play goes on. Not a cloud in the sky, perfect weather, perfect ice...... and it´s Day 3 of the European Mixed Curling Championship in Madrid. It´s a four draw day today and crunch time for the teams looking for a place in the quarterfinals. 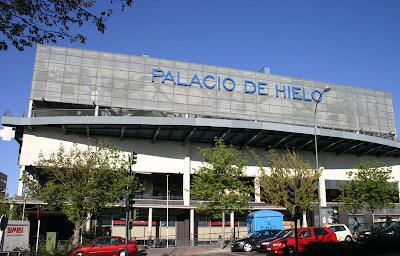 Before I forget though, I should point out that there are no rocks and no tossers here at the Palacio de Hielo. 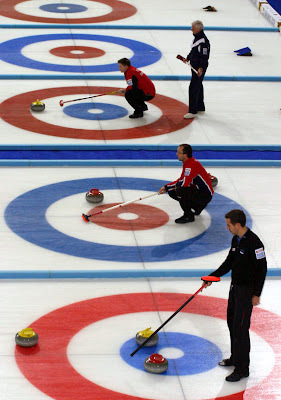 The World Curling Federation has decreed that the things we throw up the ice should be known universally as ´stones´. And the decision on who has last brick on the first end is decided , not by tossing a coin, but by a single granite draw to the button. The team whose chuckie is nearest the tee gets to play the last Ailsa of the first end. 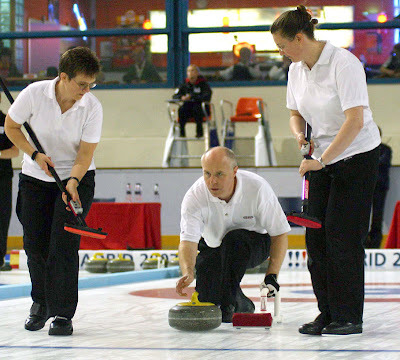 Muirhead, Muirhead, Muirhead and Sloan (Curlers) faced France in the morning game. It was going well until Glen missed an open hit in the fourth and the Scots were down 3-1. France took another single against the head. The Scots got three back - it was a roller coaster. Down one with last stone in the eighth, Glen then played what he will probably remember as one of the worst in his career. Instead of two (or even three) for the game, the Scots picked up only a single, and it´s on to an extra end. This correspondent could hardly watch! Suffice to say that with his last stone of the game Glen played a perfect draw to the button round the guards. All is forgiven! The French skip attempted an angled raise, but missed. Talk about ´get out of jail´cards! Anyway, with one game still to play Scotland share top place in the section with England, with three wins and one loss each. They play each other tonight, the winner through to the quarterfinals. From top: The complex containing the arena; Mark Callan and Scott Henderson, ice technicians extraordinaire; The Spanish team has attracted a lot of interest from the local media; Gordon Muirhead encourages his sweepers in the game against Latvia; the eyes have it for Eve Muirhead. Not a cloud in the sky, warm in the high twenties, perhaps the last thing one might expect to be doing in Madrid is curling. 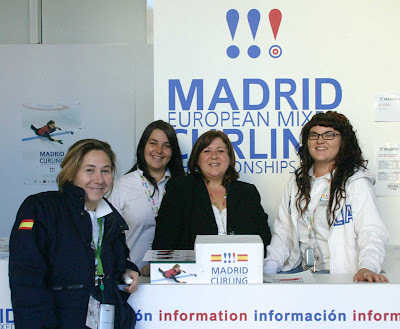 But here we are, the second day of the European Mixed Championship. There are twenty-four countries playing off for the title. Bulgaria and Kazakhstan were cancellations, necessitating a redraw. Four sections of six teams now. 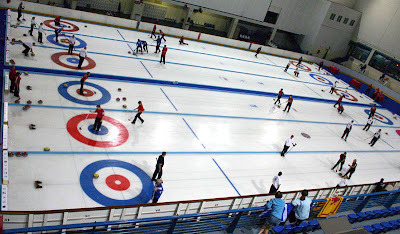 The Dreams Palacio de Hielo is a large shopping and entertainment complex with cinemas, ten pin bowling, restaurants and a huge ice arena, which Scott Henderson and Mark Callan, ice technicians from Scotland, have transformed into a six sheet curling facility for the event. Scotland faced another of the new countries today, Latvia. Two at the first end, three more at the third and the team of Muirhead, Muirhead, Muirhead and Sloan were on their way. When it looked as if the Latvians were staging a bit of a come back, Glen played a five star wick in double takeout and the game was won! Full scores and standings on the event website here. I missed Scotland´s first game against Norway, but by all accounts the Scots did not get out of the blocks quickly and found themselves 6-0 down. Hard to come back from that. Against the Czech Republic in their second game Glen Muirhead came up an inch short with his last stone of the 5th, and instead of a tied game the Scots were down 2-4. They blanked the sixth and engineered a two at the seventh. They set up the steal well in the last end. Czech skip Karel Hradec just overthrew his final stone and the Scottish supporters breathed a sigh of relief. One loss, one win on Day 1. 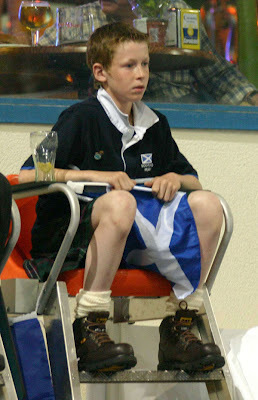 Photos: Another member of the Muirhead family, Thomas, watches anxiously. 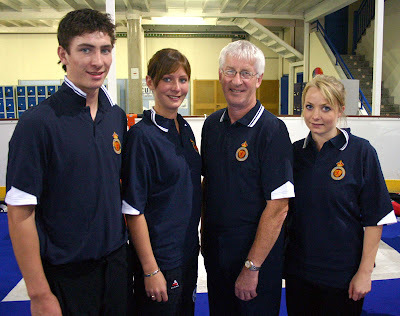 L-R Glen Muirhead, Eve Muirhead, Gordon Muirhead, Anna Sloan. 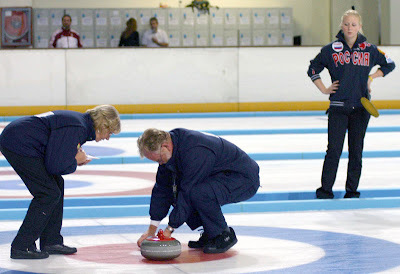 Well, this is the 100th post to the Curling Today blog! 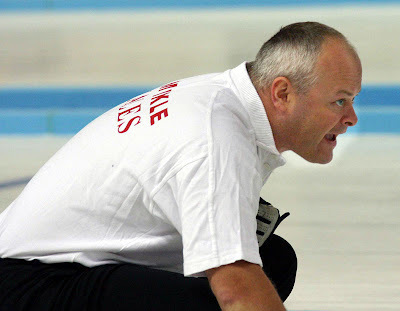 When I started off back at the end of last season (April 22 to be precise), I was following in the footsteps of the Canadian publication The Curling News, whose editor George Karrys had been blogging away for a while (see here). I was unsure of two things. 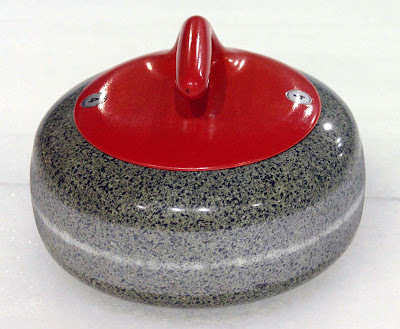 Would there be much news to report on over the summer months which might be of interest in particular to curlers on this side of the pond, and would anyone even bother to look at the site. I have been surprised and delighted on both counts. Thanks to all who log on regularly. I appreciate your support, and I hope what you find here is informative. I've been asked if the blog will continue through the season. 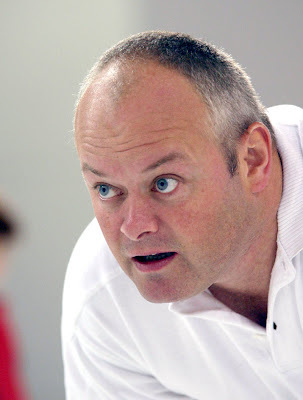 The blog exists of course primarily to complement and promote the Scottish Curler magazine. October's magazine is currently being printed, and the plans for November's issue are well in hand. It is certainly the intention of the Scottish Curler team to continue to post current news items to the blog, as these becomes available. 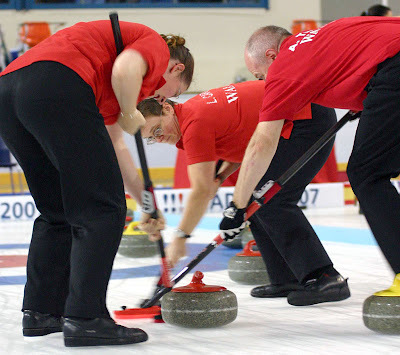 The print magazine will have a news summary as before, as well as the other features, reports, comment, and photographs that make it a publication that curlers want to read. 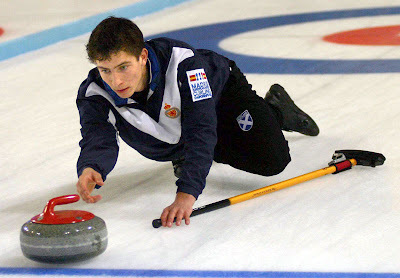 And of course the Scottish Curler now has its own website. Talking of photographs, the Scottish Curler Photography site has undergone a makeover for the new season. This site simply showcases some of the best photos from the magazine's photographers that come across the Editor's desk, many of which don't make it into print. The new season gallery is now open, and a selection of the best, most interesting, pics will be added here as the season progresses! If you need a photo for a specific purpose, all are available to purchase. 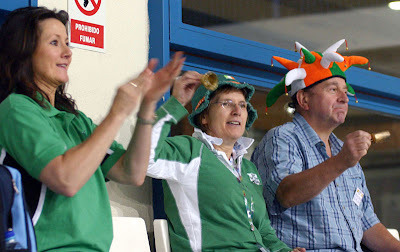 The European Mixed Championship begins tomorrow (already previewed here), and with any luck my 101st post will be from Madrid. In the meantime you can find the results on the event website here. Scotland's first game is Tuesday against Norway. 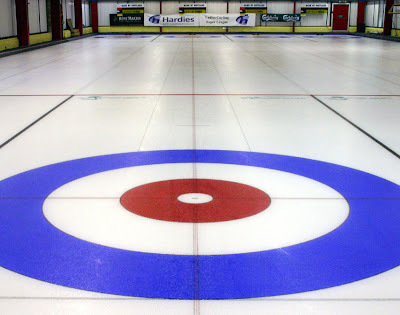 Most curlers don't appreciate how much knowledge is needed to produce excellent curling ice. The Kinross rink was looking good and playing well when I visited at the weekend. Steven Kerr makes the ice there and has been persuaded to give a talk on Wednesday, October 10, 7 for 7.30pm start, in the Loch Leven suite of the Green Hotel, on how the ice is made. It's not just frozen water! 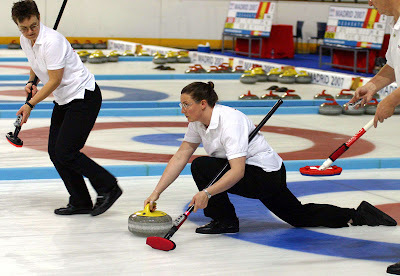 The informal evening is a venture of the Kinross Curling School. All are welcome. A glass of wine and the opportunity to win a Performance brush are the incentives. Ena Stevenson (EnaStevenson /at/ aol.com) is the contact for more information. Members of the Curling School were hard at work Saturday introducing the sport to some visually impaired curlers. Expect this discipline to take off around the world soon. 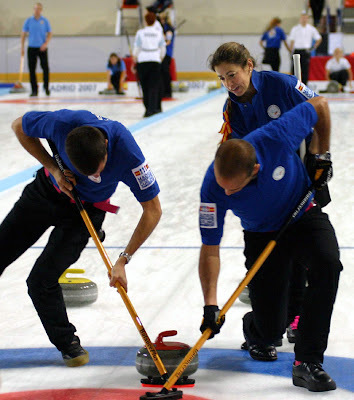 A recent article noted that the Canadian Curling Association has taken note of the number of blind curlers competing in Canada. Above: Ena Stevenson explains the game to newcomer John Barber. 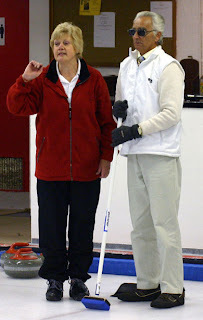 The Kinross rink held a 'come and try' for visually impaired curlers last Saturday. Elsewhere in Europe at the weekend, teams skipped by Kelly Wood and Claire Milne both reached the semifinals of the Radisson SAS Oslo Cup. The other Scottish side, skipped by Sarah Reid, won two, lost two in their preliminary section. Canada's Jennifer Jones won the final. 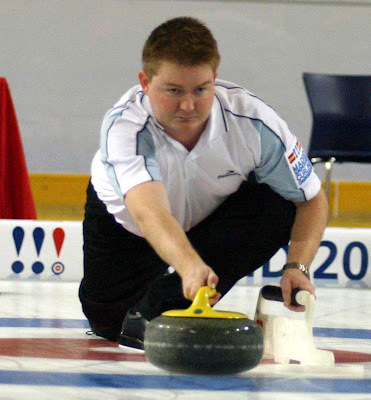 David Murdoch, for the second WCT-e event in a row, made it through to the playoff stages before losing out in the quarterfinal of the men's competition. Logan Gray's team had a two win-two loss record. 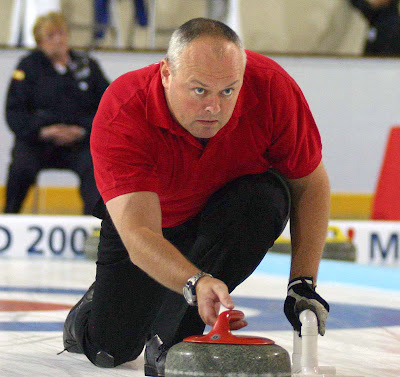 Canada's Kevin Koe won the event.